On 30th September 2016 we were part of a very exciting event to determine, from a patient perspective, what the research agenda should be for social scientists researching genomics. Here, patients and their representatives (some from the 100k Genomes Project, others from families with genetic conditions) met with 5 social scientists from a Genomics England GeCIP on social science and ethics. 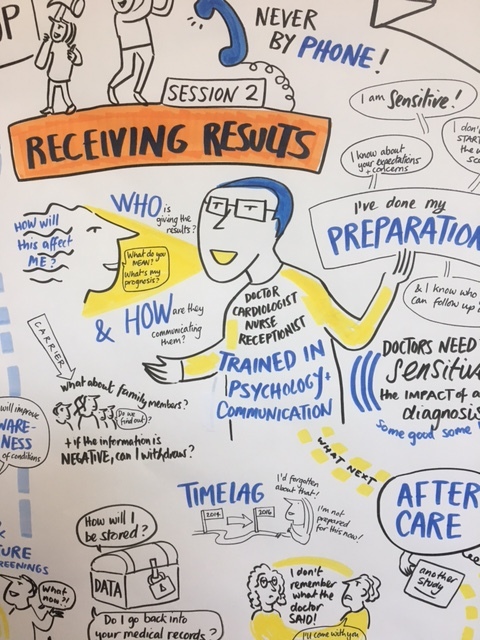 The conversation was specifically orientated around the patient experience of sequencing (before, during and after testing); this was used as a platform to explore new research questions to address psychological, social or ethical issues that patients deemed important. The social scientists included myself from Wellcome Genome Campus, Pauline McCormack and Simon Woods from Newcastle University, Saskia Sanderson from UCL and Chris McKevitt from KCL. 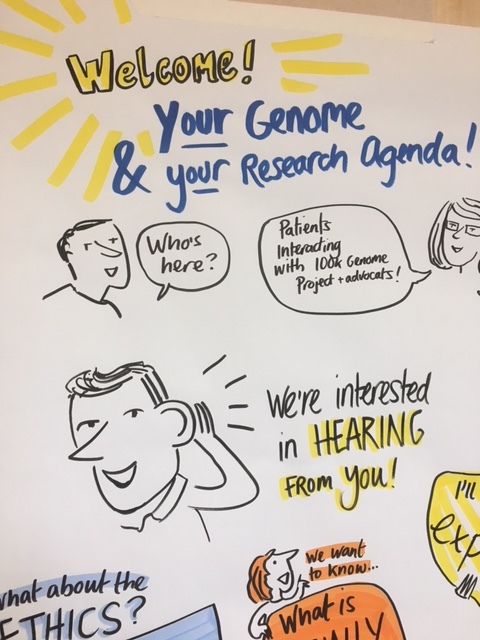 The event was facilitated by Steve Scott and Becky Gilmore from the Public Engagement team at the Wellcome Genome Campus and outcomes captured by an illustrator. The Public Engagement experts used an Open Space method to encourage discussion and debate amongst the patients. This discussion was captured on a ‘graffiti wall’ and used as the basis for refining ideas and gaining group consensus. Alongside this, the illustrator captured an essence of the discussion as it evolved. This collaborative event, was structured enough to enable focussed discussion, but flexible enough to enable new psycho-social issues to emerge, dictated by the patients themselves and offered as suggestions for the focus of future research. The social scientists listened carefully, without judgement and heard directly from patients, what was important to them. From this we were able to determine a collection of research questions that patients felt social science should address.